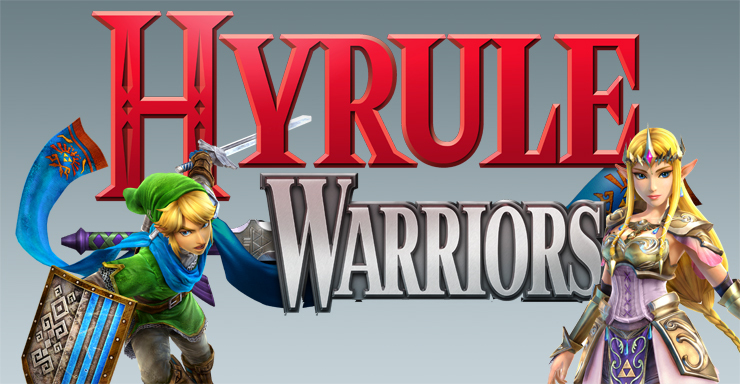 Welcome to the official discussion thread for Hyrule Warriors on the Wii U! To start, please add this game to your log, add it to your collection (if applicable), and (when you are ready) rate it using the link above! Through all the stories and all the timelines found in the Zelda series... nobody saw this coming. Koei Tecmo and Nintendo team up to take the Dynasty Warriors formula, toss in a lot of Zelda-franchise fan service, and blend that stuff together in a funky mish-mash of Zelda lore that only the Wind Fish could dream up. That game is called Hyrule Warriors. I was admittedly hesitant on this title upon first announcement. I had no idea what the Dynasty Warriors franchise was all about. I knew I loved Zelda. It wasn't until the excellent Nintendo Direct (embedded below) which sold me on the idea. I'm seeing a lot of reviews, which started coming in today, and they seem to agree that this isn't much of a Zelda game. I have to point out, the name borrows the Warriors from Dynasty Warriors and not Zelda. This alone helps me see what Koei Tecmo and Nintendo were aiming for. This isn't going to be a Zelda main-line game nor is it striving to be. For what it's goals are, and for what Nintendo has contributed to it, I'm pretty excited myself and now there's less than 10 days remaining. The game releases on September 26th, 2014. 1.) Sends Link and 12 other playable characters from various Zelda universes into other universes. Mixing things up! 2.) Loaded with various locales, enemies, bosses, items, and music from throughout the Legend of Zelda series. 3.) Series offers plenty of DLC options (detailed below). 4.) Tons of combos and special moves for each character. NOTE: While the Retailer-Specific DLC is day one, shortly after release all DLC will be available for purchase from Nintendo for presumably a small fee. Thus it will be possible to obtain all DLC and not be stuck just because you chose one retailer over another. Upcoming DLC Packs - Various DLC will be available through February (in Japan), see those details here. Hmm, still kind of on the fence. May get it eventually though, getting to play as all of these Zelda characters is tough to pass up. good comments on the adventure mode... and where's the voice acting in this game??? I thought that maybe only Link would be silent..but no. Everyone speaks...through text. Will Zelda U be like this? Even if I wasn't so hard up for cash right now, this would be one for the bargain big down the line. Can't wait. Day 1, straight to the shelf. Good times. I pre-ordered this through Futureshop during E3 so I could get it for a $20 discount. I checked out a couple reviews and I'm getting pretty hyped! I've got mine coming through Amazon. Quite excited to play it! Excited to unlock all that's available. I personally wouldn't ever trust an IGN review to be a definitive source for opinion. I highly encourage you to read GoNintendo's review, which is linked in the OP. It's got a very well rounded consideration of the title and omits any score because in the end that's mostly frivolous information anyway. One person's 7 could be another person's 9 or 5 even at the same quality expectation level. GoNintendo has a lot of perspective. IGN's review itself did have some useful view points though. It is one of the better reviews out there. Score-wise it's got a 74 on Metacritic right now with quite a few 80-90 ranges and even a 100 from Telegraph. Still not sure if I want this Day 1 or not. All I'd get are Ganondorf outfits, which don't look all that good. Huge Zelda fan, Dynasty Warriors is some solid mindless fun. I will warn people, if you've never played one of these games before it is very love/hate. You either enjoy the hook, or you think it's the worst thing ever. @SormonI echo Finks view on this. If you are going to go by score, at least read several reviews. My friend is getting this for sure, so I'll play it at his place and see how I like it... Probably waiting until it is cheap and there is a game drought. 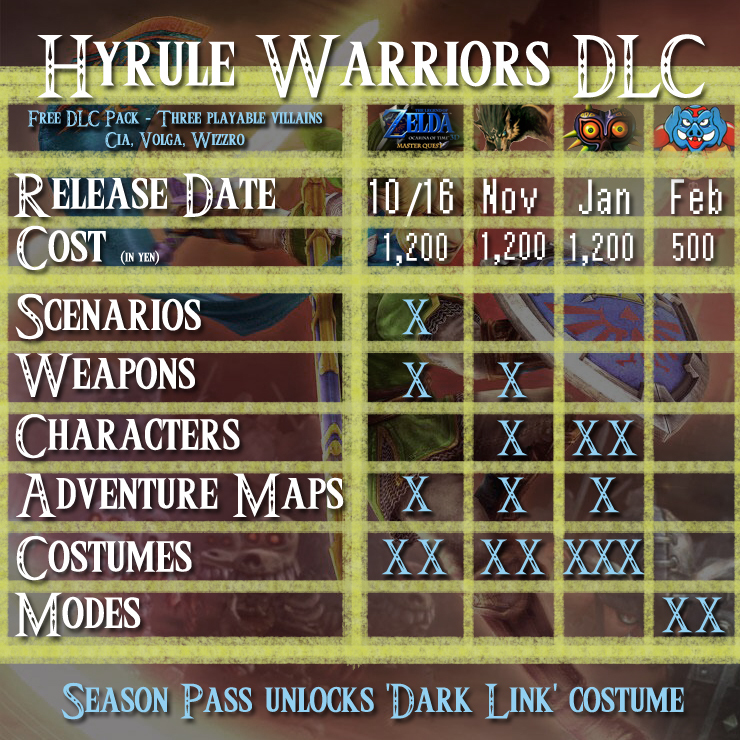 NOA said a "season pass" (urgh, there's that phrase) would run 20 bucks and comes with a free Dark Link costume. I'm all for DLC when it isn't so, I dunno, expensive I guess. Fire Emblem also did DLC completely wrong. Holding off characters for DLC stings when the main game only has 13 playable characters. I was really disappointed when I found that out because Pirate Warriors 2 had over 40 characters. And it's not like there aren't a lot of characters to choose from in the Zelda series. I get that the alternate weapons kind of make the existing characters play like new ones, but which would you rather have? Link with a fire rod, or Din? This all said, any speculations on the MM characters? I'm guessing Skull Kid and... Umm, the Happy Mask Salesman??? If it follows the trend of this game, it'll be Lulu and the Kamaro Sisters. I should be receiving this game next week, got a good deal on a preorder. Should be fun to run through co-op with the wife. One hour in, enjoying it a lot more the more I play of it. It's very arcadey, but smarter than it initially seems. Lots of fun so far! EDIT: Preordering from Amazon.co.uk got me the Skyloft costumes. Yeah, the DLC stuff is pretty disappointing to see. It seems expensive for what it is, and it's releasing so early that it's tough to not question why it isn't in the game already. But to be fair, I wasn't very interested in this game to begin with, as I'm not sure if it's a style of game that I like. I wasn't going to be getting it at launch, and now I'm not sure if I'll even go for it on sale. Thanks for posting that! I was too tired yesterday to do so. I'll maybe add it to the OP or link it. I dunno man, as someone new to this series, that many characters on disc seems like more than enough. I was trying to explain another possible side of this to Ninsage earlier. I could see Nintendo having told the developers to get the game out on X date. But to keep interest going, let some of the team work on some optional DLC to release periodically after. These are probably things that can't be put in the main game to meet the schedule. Plus the game sounds like it's already got more than enough content to call it complete without any DLC. To me, that's a fair reason to have DLC. I don't feel the game is any less enticing if I don't get it. Seems fair to me. Particularly when it's not even required to enjoy a full game with Zelda as the theme.